Pulitzer Prize Photographs: A Traveling Exhibit of Award‐Winning Photography. http://www.newseum.org/exhibits-and-theaters/traveling-exhibits/ [Retrieved 12/27/2013]. For some reason I thought it would be a good idea to take my girlfriend for a date through the Pulitzer Prize photography exhibition in Philadelphia. She is much more artistically‐minded than I and we had talked before about visiting a gallery or museum sometime. I love photography and thought that the exhibit would be a classy and apt hybrid between our interests. What I had forgotten was that the Pulitzer Prize is awarded for photojournalism, which meant that though each shot was notable for composition and technique, they primarily represented the biggest (and often most tragic) news events of each year. This meant that our “date” consisted mainly of silently studying the most graphic, gut‐wrenching photos of every major war, famine, and natural disaster from 1940 and onwards. There were photographs of Iwo Jima, of mass graves in Rwanda, of the World Trade Center exploding, of soldiers in Vietnam and Aleppo and Syria and Zimbabwe and Cambodia, of funerals and caskets. There were photographs of assassinations, of executions and prisoners, of burning and bloodied bodies, of race riots and shootings, of lynchings and genocide, of women buried under mudslides and earthquakes, of children with mangled limbs and gaunt skeletons and napalm‐seared flesh and in body bags. In essence, it was a collection of the world’s most provocative and inarticulably dense depictions of human emotion. Kent State Shooting. http://www.famouspictures.org/kent-state-shooting/ [Retrieved 12/27/2013]. Click here to see how to view the picture via the copyright holder. It was not the most romantic of venues. New Years is usually the time in which we stop to remember major events and milestones. It is often said that “those who cannot remember the past are condemned to repeat it,” but is the act of remembering really that helpful? The rallying cry in a post‐Holocaust world has been “Never forget,” but as my brief trip down the world’s memory lane reminded me, such retention does not necessarily beget a just and civil society. Though memory can serve as a sober reminder and ward against injustice, it also has a way of twisting over time, warping the narratives of our lifetime experiences in ways that promote vengeance and actually perpetuate injustice. We can all think of traumatic events in our personal lives that have degenerated into bitterness and spite over time; how much more has this been possible in the national or international consciousness, in Kosovo and Syria and Afghanistan and the Congo and Palestine? The End of Memory: Remembering Rightly in a Violent World by Miroslav Volf. Eerdmans. 2006. Aid From The Padre. http://www.famouspictures.org/aid-from-the-padre/. [Retrieved 12/27/2013]. Click here to see how to view the picture via the copyright holder. 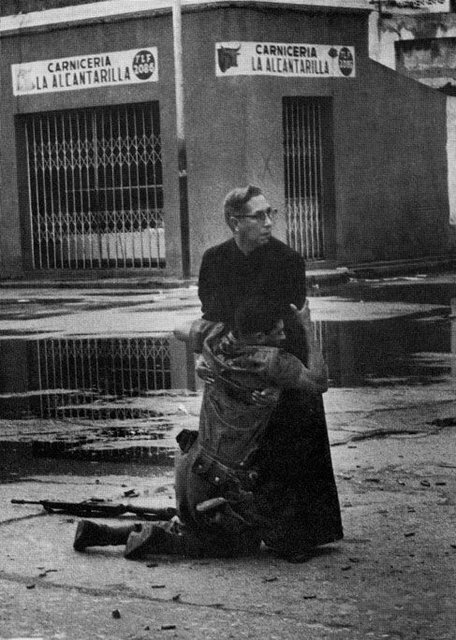 One picture in the gallery that stood out to me was 1963 winner “Aid from the Padre,” a photograph of a chaplain giving last rites to a solider bleeding to death in his arms as they stood in the midst of machine gun fire. The priest looked down the street at the source of rebel of sniper fire, his face stunning as an expression of alertness without terror or malice. In our world of horrors, what will we choose to remember and how will we choose to forget? What will it mean to look back upon the grief of the nations and maintain the courage to look forwards even as we embrace the weak, the dying, the killers, the now and future dust of the earth?